Description: Comes with the NFC Reader and an amiibo card. 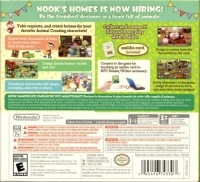 Box Text: NOOK'S HOMES IS NOW HIRING! Design dream homes -- inside and out! Expand your play with amiibo. Connect to the game by touching an amiibo card to NFC Reader/Writer accessory. Invite characters to the game, assign them roles in the town, and save their home designs! 04-11-2016 desocietas Box Text NOOK'S HOMES IS NOW HIRING! Be the trendiest designer in a town full of animals. Take requests, and create houses for your favorite Animal Crossing characters! Choose from thousands of items to create your client's ideal living space. Design dream homes -- inside and out! Transform downtown with shops, a hospital, and even a school. Collect and connect! Expand your play with amiibo. amiibo card included! Connect to the game by touching an amiibo card to NFC Reader/Writer accessory. Design a custom home for the animal on the card. Invite characters to the game, assign them roles in the town, and save their home designs! 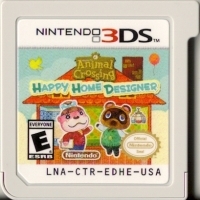 This is a list of VGCollect users who have Animal Crossing: Happy Home Designer - Included Nintendo 3DS NFC Reader/Writer in their Collection. This is a list of VGCollect users who have Animal Crossing: Happy Home Designer - Included Nintendo 3DS NFC Reader/Writer in their Sell List. 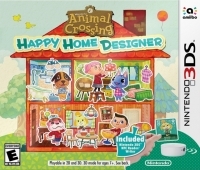 This is a list of VGCollect users who have Animal Crossing: Happy Home Designer - Included Nintendo 3DS NFC Reader/Writer in their Wish List.